Are UPVC Tilt and Turn Windows Worth Buying? Are UPVC Tilt and Turn Windows Worth Buying? What’s so different about UPVC Tilt and Turn Windows? How energy efficient are they? How much do the replacement windows cost? But it’s also worth considering how they work. Are there any functions that could make life a little bit easier or would better suit the situation? In terms of unique functions, UPVC tilt and Turn windows stand out from the rest. So, what’s so different about these windows, and are they worth buying? 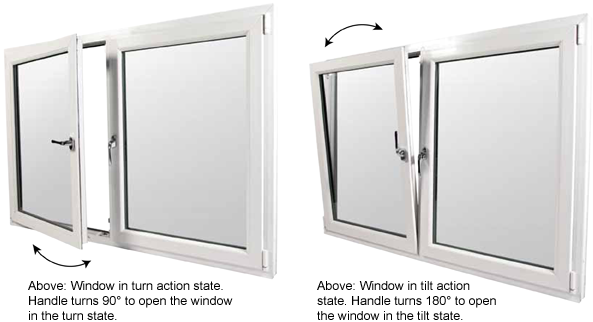 What is a Tilt & Turn Window? The casement is attached to the surrounding frame by one or more hinges. The hinges can be at the side, as in a regular casement window. The hinges can be at the top, as in an awning casement window. The hinges can be at the bottom, as in a hopper casement window. With a Tilt & Turn window, it has specialised hinges that allow the casement to open and close like both regular and hopper windows. In effect, it can TURN like a regular window or TILT like a hopper window. Both movements allow the window casement to open inwards. Although it is the only window that has a 2-way opening function (if you ignore the variants show below). The functions are controlled by a single handle. Move the handle one way to operate the turn function. Move it in another direction to operate the tilt function. Turning: The window moves from the side hinges to open inwards. It has a very wide arc of opening – 90 degrees or more. Tilting: the window “leans” backwards into the room. The amount of lean is restricted by the hinges to several inches only. This is for safety & security reasons. The tilt function provides a lot of ventilation without having to fully open the window. Very useful in a high humidity environment such as a kitchen or bathroom. The wide opening side turning arc means that the window can “double-up” as a doorway. Larger versions are very often used as patio doors. This large opening is big enough to be used as a means of escape in the event of an emergency. It also means you can access the exterior of the window quite easily from the inside of the house. Great for cleaning in upper floors (such as upstairs windows or if you live in a high-rise). As a result of this inward opening, the biggest potential disadvantage is the inward opening nature of the unit if you have curtains and blinds. Additionally, if you store items on the interior window cill (or a shelf just below the cill such as a kitchen worktop), when you open the window it could interfere with them. Two options come to mind here, first is the Tilt & Slide version, second is the reversible window. With Tilt & Slide, the turn function is substituted by a side-to-side sliding action. You can’t’ tilt & slide at the same time. It’s one or the other. This feature works well as a patio door. Reversible windows, as the name suggests, can be “turned inside out”. Yet again via a set of specialised hinges, this casement window can be rotated through almost 180 degrees. The basic function is similar to an awning window, where the hinges are at the top of the frame, and opens outwards. Given the options above, are there any functions that could make your home life a little bit easier? 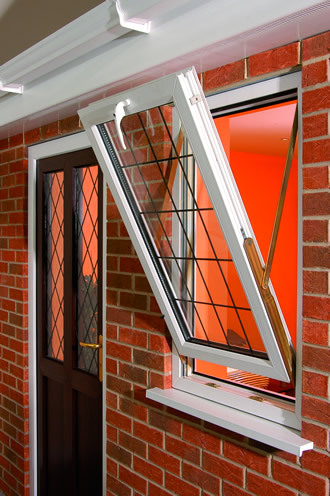 Are there any scenarios where UPVC Tilt & Turn windows would better suit your situation? If so, we can find accredited UK installers to quote for your work – just send us a few simple details of your project and we will arrange for Local professionals to give you their prices for free.